We’d been planning another camping road trip over the summer, this time heading way North to the bonny Scottish Island of Tiree, to mix a bit of business with pleasure. We were all looking forward to camping, windsurfing and exploring the Island and couldn’t wait to depart. Our journey was a whistle stop 5-day tour, leaving Wales on the Saturday, via an evening meal stop off at the Firebird Restaurant in the heart of electric Glasgow. It’s a stunning venue with a mouth-watering menu that you must try to visit if you are ever passing through the city. Once fed and watered we headed off further north to the twee but very cute town of Inverary, to grab a quick snooze before heading to catch our ferry from Oban. Inveraray is a tranquil coastal town, or I should say a town surrounded by a Loch. Whilst we drove through at 7am I could see that there were plenty of gorgeous boutiques and coffee shops, and I was desperate to have a quick walkabout. But we didn’t have time to stop so I hoped we may be able to on our return journey instead. My wave rider hadn’t booked a ferry ticket, as we were told it was full, but he confidently chose to park up in the queue and hope for a cancellation. To our delight we got a space for our speed wagon, if a bit squashed in pressed up close to the delivery wagons. We grabbed our cushions, magazines and the iPad, and found a cosy spot on the upper deck of the Calmac ferry. On previous trips I have arrived across very stormy seas and gales force winds, but this was a stress free crossing and we soon arrived into the harbour at Tiree in calm waters. This island is known for being one of the sunniest yet windiest parts of the UK so we knew we had been lucky. Once safely on solid ground we stumbled upon our first beach of the day, Crossopol. It was quite deserted for the time of year, but I was quietly satisfied about having the views to ourselves… and what a view! Tiree is about 20 x 10 km in size and has a wide expanses of low-lying grassy plains, but also half a dozen modest hills dotted around. The beaches are also gorgeous, with yellow sand, rough grass, open ruggedness and wild beauty. It wasn’t too long before Jim (my lovely wave rider) spotted what was to become our daily bread…a crepe van! If there was ever to be the perfect beach picnic in fast food format, then a crepe it is. Within minutes we had made good friends with Margeux and Ben. Locals who had only been set up a couple of months, and intended leaving for sunnier climates in OZ for the winter months. Tiree Wave Classic 2012 from RedHandedTV on Vimeo. We chatted over savoury and sweet crepes hearing their fascinating stories and plans for the future. We even managed to persuade them to stay on longer so they could attend our Wave Classic Tournament during 13th -19th October, where they could feed our competitors lunch each day and party with us each evening before setting sail to the Gold Coast. Once fed and watered we decided to roam the island looking for our pals and set up camp for the evening. We had a busy next day planned as we had a meeting with local businesses to discuss the Wave Classic Tournament logistics. Work life is a beach however, and we were very happy to hop between coves and bays to take in the stunning scenery whilst making notes along the way. Our good friend Willy from Wild Diamond had the most impressive campsite, only minutes away from his windsurfing and Stand Up Paddle Board (SUP) School. On our recent trips we hadn’t had the pleasure or time to camp, even though we had heard about the facility, and we never realised just how ‘tip top’ it was. Not only was it easily accessible from all the beaches, but it was also a quiet pitch surrounded with fields. The best parts were the outbuildings, offering kitchen, bathroom and living quarters with a very fast wi-fi service…. BINGO! After all, we were there on a business (with a little pleasure mixed in), so having connection to the outside world was a huge bonus for us. I should mention that the majority of telecommunication channels including Orange, O2 and 3 don’t get good reception, and the best service by far was Vodafone. Just something to bear in mind if you decide to visit the island. During our stay on Tiree we dined in style at the Tiree Lodge Hotel and retired happily for cosy evenings in the campervan pitched up either at the campsite or at our friends. Then after healthy, vegetarian cooked breakfasts in the morning we managed to hit the beaches by mid day to check for wind and waves. Our meetings were mostly during late afternoon so it gave us plenty of time for Jim to sail and for me to make notes for my book and blog. 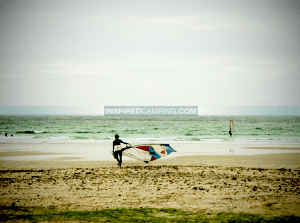 We had a fantastic camping road trip and I highly recommend Tiree for any water sports and camping. It’s a mesmerising island, and one that holds onto its heritage and charm in equal amounts. Truly Scottish and truly gorgeous! Sign up for our free updates to be one of the first to hear about future articles and competitions. It’s free, you can unsubscribe at any time and it will give you access to regular articles and giveaways. Also, for daily competition updates and to see some of what goes on behind the scenes at Inspired Camping you can ‘Like’ our Facebook page. Plus, for daily ramblings, inspirations and cool camping and glamping chat you can follow Sarah on Twitter.